When I was a Greenhand member in FFA, I met some amazing state officers who gave me the confidence and inspiration to dedicate myself to following my dreams. My hope for this year of service is that I will be able pass on this inspiration and confidence to as many FFA members as possible. I am extremely motivated by the future. The past has already happened and whatever it holds cannot be changed. In contrast, the future is entirely blank and yet to be written. The idea that I determine my future is fiercely empowering to me. I plan to attend the University of Missouri-Columbia and major in Agricultural Education/Leadership. 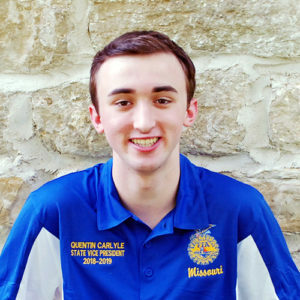 While I do not know the exact career I plan to go into after college, I hope to be an active member of my community and an advocate for the agriculture industry.